Pakistan’s failure to take 20 wickets in all three tests was responsible for their series loss in Australia and the situation will not improve unless players get more exposure to conditions Down Under, captain Misbah-ul-Haq said on Jan. 7 Misbah’s team arrived in Australia with their hosts in disarray after a 2-1 home series loss to South Africa and the tourists were confident they could at least take one test in the series, if not emulate the Proteas. Despite the odd patch of competitiveness, Pakistan were largely outclassed and their demise was completed at the Sydney Cricket Ground on Jan. 7 when they crumbled to a 220-run defeat to lose the series 3-0. “Our bowling is always our strength but in this series I was a bit disappointed that we couldn’t take 20 wickets in any of the tests,” the 42-year-old Misbah told reporters. “That’s why we were so behind in every game, that’s important for you in Australian conditions. If most of the Pakistan tour highlights came from batsman, the biggest disappointment was probably leg-spinner Yasir Shah, who arrived on his first tour Down Under with a big reputation but departed with eight wickets at a cost of 672 runs. He was not the first vaunted spinner from South Asia to struggle to adapt to the conditions. 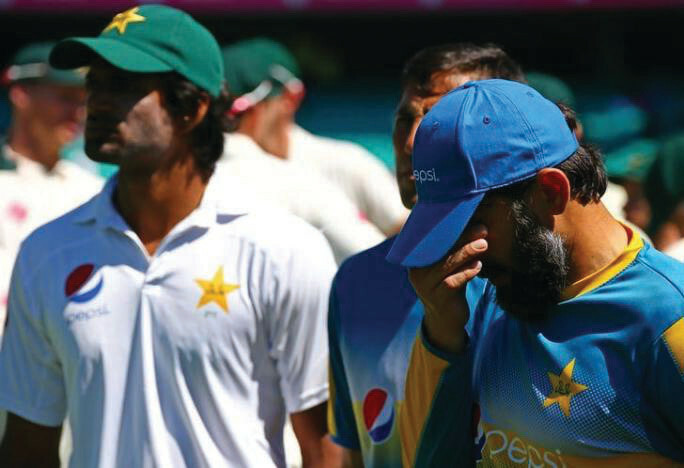 The Jan.7 defeat was Pakistan’s 12th straight in Australia through four series sweeps since 1999 and Misbah said youngsters identified as test prospects had to be given a chance to taste the conditions earlier in their careers. “If we are not touring more often in Australia and South Africa, this could happen again and again,” he said. “I’ve already suggested that some of our players should be sent to Australia on a regular basis to play games here… this is the only way we can improve. “If you are coming here after four or five or six years, seven or eight guys are coming here for the first time. We are going to struggle.”Pakistan’s bowling woes were not helped by the number of injuries with pace spearhead Mohammad Amir in the treatment room for much of the series. “To win in Australia, your fitness is vital, in any other country you can survive but in Australia you need supreme fitness,” Misbah added.Misbah, who has said he will return to Pakistan before deciding on his future, thought the manner of the defeat in the second test in Melbourne, where the tourists were dismissed for 163 on the final day, had been another decisive factor.